For all you girls who want a BIG color payoff and the convenience of a pencil, Urban Decay Super-Saturated High Gloss Lip Color is one of the best products out there! The formula is extremely creamy and soft, so it was a dream to apply. The finish is opaque and the pigmentation is super deep. My favorite shades were Adrenaline, a deep fuchsia with micro glitter that has become my go-to for a fun party lip. FBomb is a bright, eye catching red for when you really want a bold lip. The colors are not only beautiful, but their staying power was incredible as well. I only noticed a slight bit of fading after 6+ hours or so. 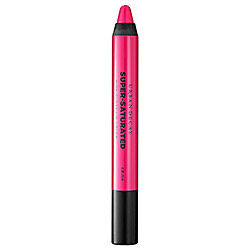 For those that love the defined look of a lip liner, this product serves double duty as a liner first, and then filling in the lips with the side of the pencil for color. The shine is just right - not to slick or wet, but more than just a dewy daytime look as well. It's was also never sticky - another big plus. Note: For best results, make sure lips are very well exfoliated and apply a light layer or balm prior to using.